Ivanka Trump hit the headlines last week for using her personal email for White House business. There was a fear she’d been sending classified information over a private system and by doing so, potentially cause a threat to the US security system. But it’s not actually illegal. In the US, personal accounts are able to be used for government business, providing any official correspondence is forwarded to a work account within 20 days for preservation. The relevant Acts state that this step is to ensure official records are not beyond the reach of journalists, lawmakers and others who seek publicly available information. This is an important practice for all of us in business too. Any information pertaining to an organisation needs to be readily accessible by that organisation, into the future and certainly well beyond the tenure of the employee, and this is severely inhibited if company matters are communicated through a personal email. In that case, the employee leaves and takes that info with them, which could be hugely detrimental to the business. However, it is pretty easy to put measures in place to mitigate the risk of this happening. 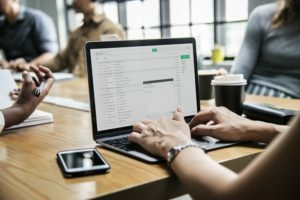 We strongly advocate for an Email Use Policy that clearly stipulates that personal email should not be used for company matters. And vice versa. The Policy should also outline that personal matters shouldn’t be dealt with via company email. It’s important to keep a separation so the lines between company viewpoint and personal viewpoint are not blurred. And of course, it’s worth including in the policy the usual rules around what is deemed appropriate content and tone when using company email.